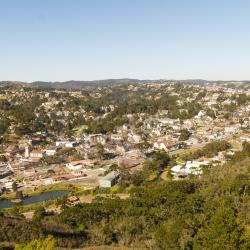 Looking for hotels near Capivari? 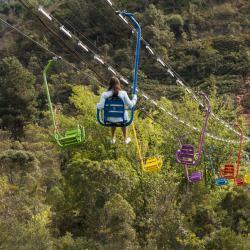 Canada Lodge is just 4 blocks from the Capivari tourist area in Campos do Jordão. It offers 4-star accommodations with a flat-screen cable TV and mini-bar. Free Wi-Fi and parking are included. 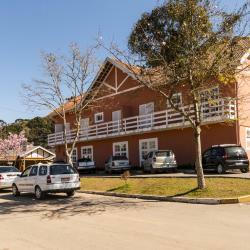 Featuring free WiFi, Solar d'Izabel offers accommodations in Campos do Jordão, 1640 feet from Capivari. Free private parking is available on site. 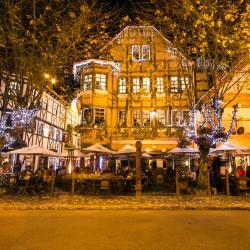 Le Renard provides 5-star accommodations in Campos do Jordão, with free WiFi and free parking. It features a heated pool, plus spacious rooms with LCD cable TV and heated bathroom floors. Just 492 feet from Capivari touristic center, this guest house features a pool, gym and a bar with a wine cellar. It offers a daily buffet breakfast and free Wi-Fi. This comfortable guest house is located in the heart of scenic Capivari Village, 262 feet from the renowned Baden Baden Beerhouse. It offers free Wi-Fi and complimentary valet parking. With free WiFi, Pousada Italia Eleganza is a charming guest house located in Campos do Jordão. A daily breakfast buffet of fresh juices and fruits is offered free of charge. Featuring a heated outdoor pool and a hot tub, L.A.H. Hostellerie offers a buffet breakfast, free Wi-Fi and a fitness center. 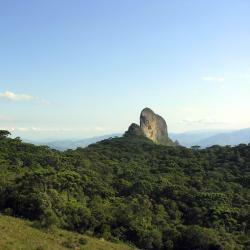 The Vila Capivari center is ideally located just 0.6 mi away. A perfect place! Everything works. Located only 0.6 mi from Campos do Jordão cable cars, train station and Capivari area, Hotel Astoria offers accommodations in an Alpine-style building. Everything was great, staff, breakfast, the room was clean and comfortable. Located 1.6 mi from the bars and restaurants in Capivari tourist center, Geneve offers accommodations with free WiFi and free parking. Buffet breakfast and a 24-hour front desk are available. Located only 164 ft from the city center and close to Bonde Abernessia, Curumi Hotel offers accommodations with free WiFi and free parking. Clean and well placed hotel. Simple, but good, breakfast with fruits, several breads, juices, etc. Hotel Ascona is located near Campos do Jordão´s popular Capivari area, featuring an outdoor pool, games room and barbecue facilities. Wi-Fi and parking are free. The breakfeast was very good. The hotel is located in a good place with a easy access. 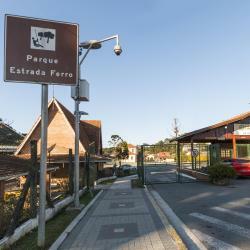 Hotel Parque das Flores is set within a park with rare flowers and mountain views in Campos do Jordão. Featuring free WiFi, this guest house also offers a buffet breakfast. 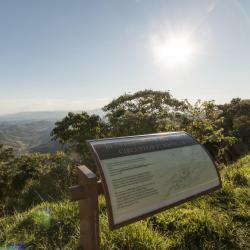 Hotel Fazenda Confiance is 6.2 mi from Campos do Jordao Bus Station and 3.1 mi from Horto Florestal forest preserve area. Hotels with great access to Capivari! Located in São Bento do Sapucaí, Hospedaria Casarão has a garden. With a terrace, the property also features a bar. A tour desk can provide information on the area. 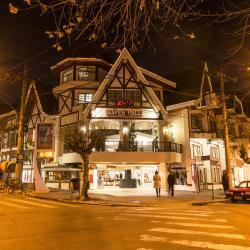 Just 492 feet from the famous Baden Baden Brewery, Villa D´Biagy is in Campos do Jordão town center. It offers solar-heated rooms with free Wi-Fi and free parking. People are talking about Capivari! Explore guest hotel reviews featuring "Capivari"
The staff were very helpful and kind. The hotel has a great location, right beside Vila Capivari, which makes it easy to enjoy the city center. The breakfast is great!! And is available till noon. Everything was great!! Very close to Capivari.